Houses, houses, and more houses. I recently finished a quilt that wasn't made by just me. I've been slow to show photos of it because I haven't been quite sure how to fit in all the photos and story into one post. Yes, I know my posts are getting longer and longer but that would be crazy. 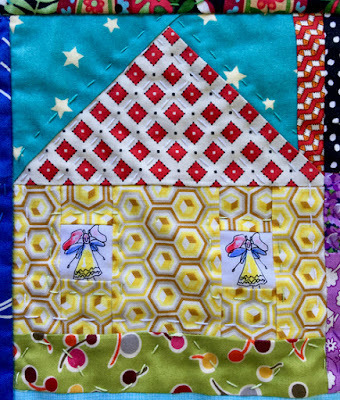 Many wonderful people contributed to the quilt and each block deserves to be highlighted so I've decided to spread them out over a few posts. 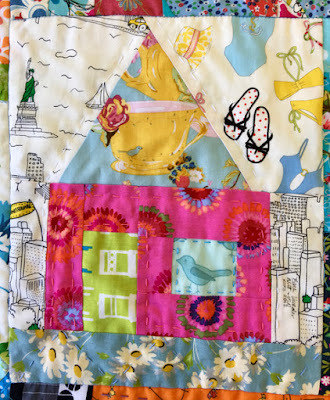 The quilt began way back in 2012 when LeeAnn of Nifty Quilts asked her blog friends to do a vintage fabric swap. I was happy to share some fabric and in return instead of sending me fabric I asked her to make me a house block. 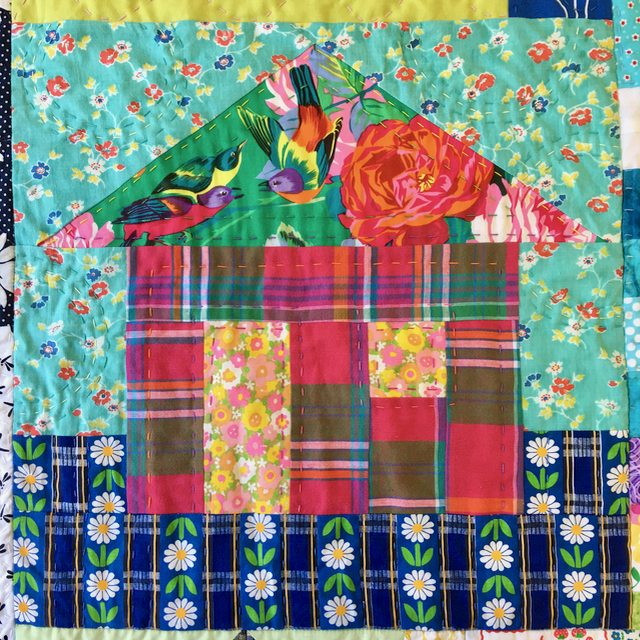 Here's the blog post about the first block- Nifty House. It arrived and I loved it but it looked as though it needed friends so I asked if anyone else would like to make a house block to add to the neighbourhood. They soon started to arrive from all around the world. There were no rules, no size, fabric, style or colour restrictions. It was wonderful to see the variety of different houses that reflected different personalities. It was such a long time ago that newer followers won't have read the Friendly Friday posts that showcased the makers of the blocks. 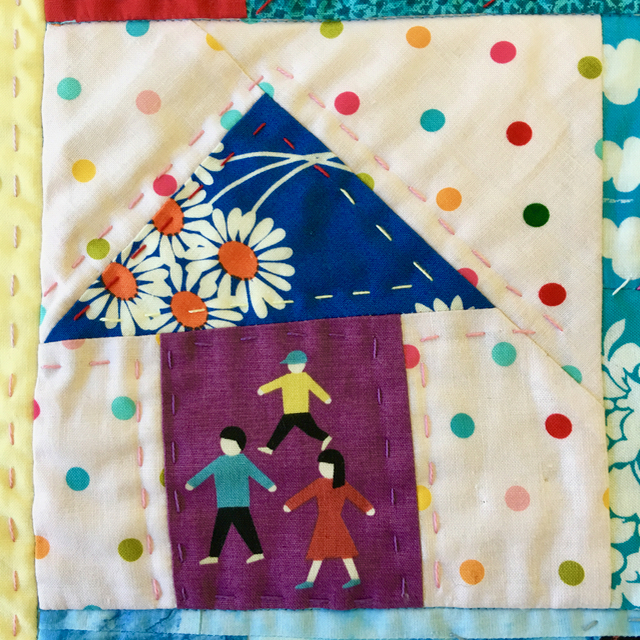 Each week I would interview the quilters and show some of their work, a fun way to record who made each house. I'll link to these posts so you can find out more about each person if you like. Okay enough talk - let's start wandering around the neighbourhood. Here's the house where it all began - LeeAnn from Nifty Quilts made a house that is soo Her! It features plaid walls, birds on the roof and a garden full of daisies. I quilted circles in the sky for no particular reason except I thought they were fun. Barb of Fun with Barb blog made a block that is so Her too. Look at the super fun sky, there's New York in the distance, a bird in the window and another daisy garden. Heidi from Germany put a sunny bird on the roof. I love the way her house looks as though its dancing. 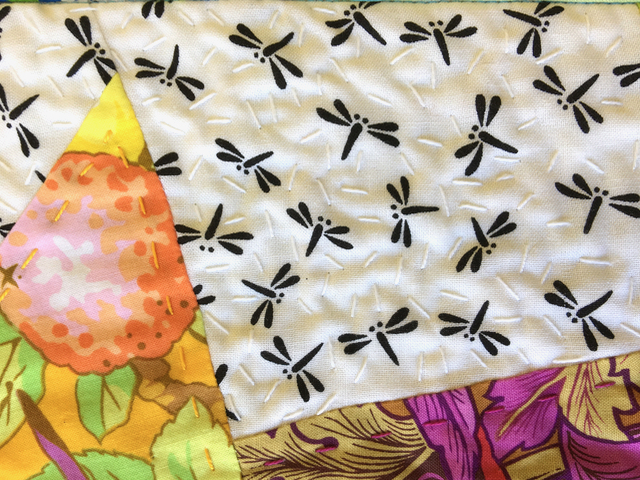 The sky full of dragonflies represents the name of her blog, Libellenquilts. I did seed stitching amongst the dragon flies because I thought it looked like their wings beating. Suz from PatchworknPlay put sweet little fairies in each window. It's always lovely to know there are fairies around. Terry from Terry's New Thread made a house full of friends. 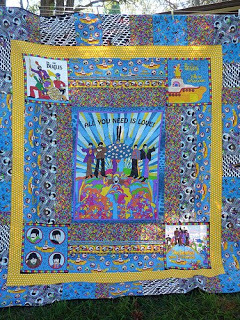 Terry and I met after she saw a quilt of mine hanging at the Springwood Quilt Show. 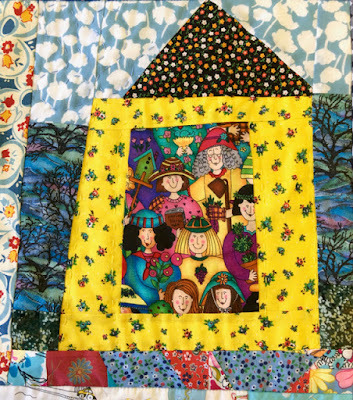 She made a house using a yellow rectangle as a reminder of the quilt that brought us together. I really need to get a better photo of this quilt, but you can see that yellow rectangle border. To finish off this post here are a couple of my little houses. Mr Daisy calls them cubby houses because they're just little houses in peoples backyards. I've used them to fill in the spaces that help the blocks fit together. I'll be back with more soon, in the meantime here are lots of links to find out more about each of these wonderful house makers. Such fun Rachael! -And look at All You Need is Love.....fabulous! I must show JoJo that! I'm looking forward to your reveal of your quilt. It sounds so happy. I must have ESP I was thinking about those houses the other day! I kind of thought they were percolating around in your head waiting to come out as an awesome quilt! What fun to see these blocks and your quilting with them! I had completely forgotten about this project, but had just recalled it last week. I do remember how joyful it felt to make you a house block. I'm enjoying looking back at your "Friendly Friday" features too. All of it is bringing smiles on my face on this very rainy day. Thank you!! Oh How Fun! Good for you for keeping such good details about all the blocks. I'm looking forward to seeing more cool blocks -- and, of course, the whole quilt! 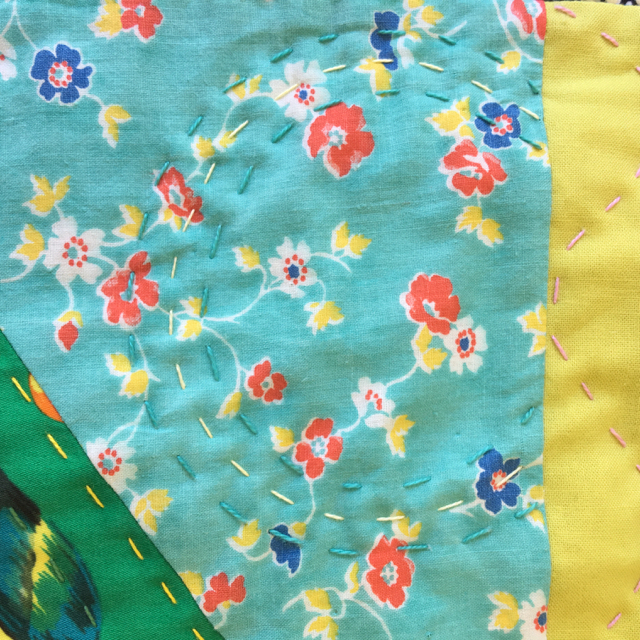 Your seed stitching is fabulous ! Such fun little houses. They might reflect the maker, but they are Oh So You! Love your little swap idea. And thanks for linking in your friends. I can't wait to see the whole quilt. I love each block, and you've introduced me to some great new blogs. Well, that was a blast from the past and such fun! I loved seeing my block again (boy, my style has changed a bit....) and the others too, of course! I went back and read what I said on your Friendly Friday post too! I must go and check out the others, although I think this was where I first met Barb and her blog! I too had forgotten about this project, but I now remember making that block when I still lived in NJ. What a wonderful post full of link to explore. What fun to see these! I had forgotten about these too. I know you'll have assembled a very lively, very lovely community with all of the blocks. Can't wait to see it! The tease of your houses is great, love the stories behind the houses, what a great swap this would be for friend. Mary Lou Weidman's did something similar but then did a companion tree swap, I have yet to put my neighbourhood together. Looking forward to your finished top. I see I need to work on mine soon. Oh I love this story and this swap ! What fun Rachael ! This is a quilt full on friendship ! Oh what fun! I'd love to live in all of them! What a great memory quilt. 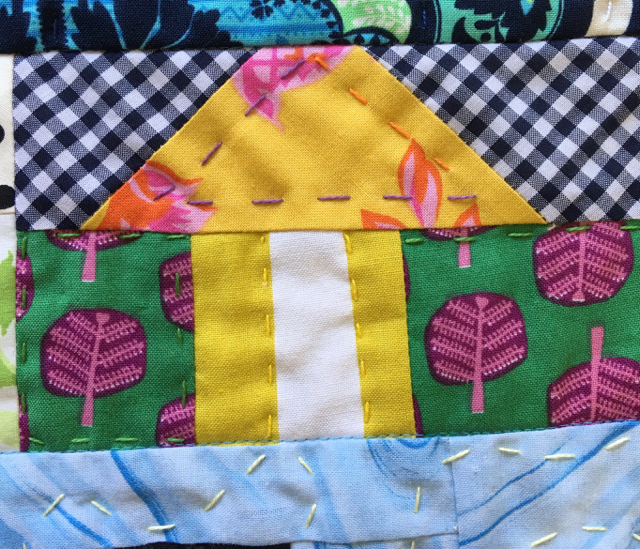 Lovely variety of houses,I'm looking forward to seeing the whole quilt now! And I am enjoying looking back at your 'friendly friday' posts, a couple of new-to-me bloggers here! Thank you Janice15 and Summer. I couldn't reply to your comments via email so I hope you read this and know I appreciate your lovely comments. Every one of these houses has its own character. they are a lot of fun. 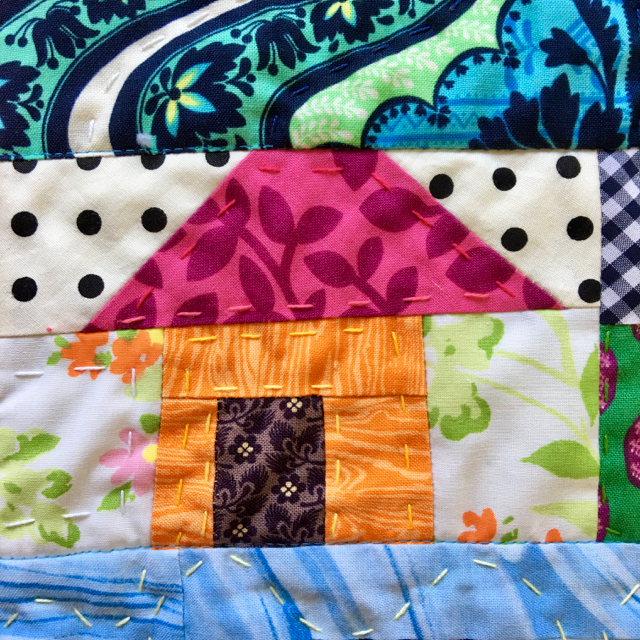 Such colourful houses, a wonderful idea for using up small pieces of gorgeous fabrics. I'm off later to visit the links. I missed the early early blogs but it's such a lovely idea. How absolutely gorgeous the house are and what an awesome quilt they wil make. 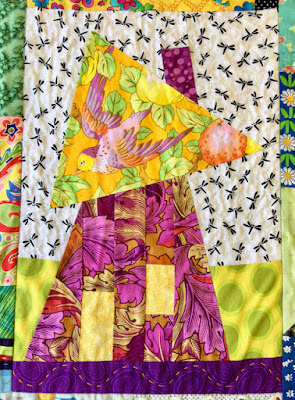 These blocks are so bright and cheery!